Galaxies are formed when ordinary matter collapses then cools down. In order to understand the origin of this formation, it was vital to discover in what form and where the ordinary matter that we do not perceive—known as the 'missing baryons'—is found. To do this, the astrophysicists from UNIGE and the Ecole polytechnique fédérale de Lausanne (EPFL) took an interest in Abell 2744, a massive cluster of galaxies with a complex distribution of dark and luminous matter at its center. They observed this cluster with the XMM space telescope, which is capable of detecting the signature of very hot gas due to its sensitivity to X-rays. Large-scale galaxy surveys have shown that the distribution of ordinary matter in the Universe is not homogeneous. Instead, under the action of gravity, matter is concentrated into filamentary structures, forming a network of knots and links called the 'cosmic web'. The regions experiencing the highest gravitational force collapse and form the knots of the network, such as Abell 2744. Comparable to neural networks, these knots then connect to one another through filaments, wherein the researchers identified the presence of gas, and consequently, the missing baryons. 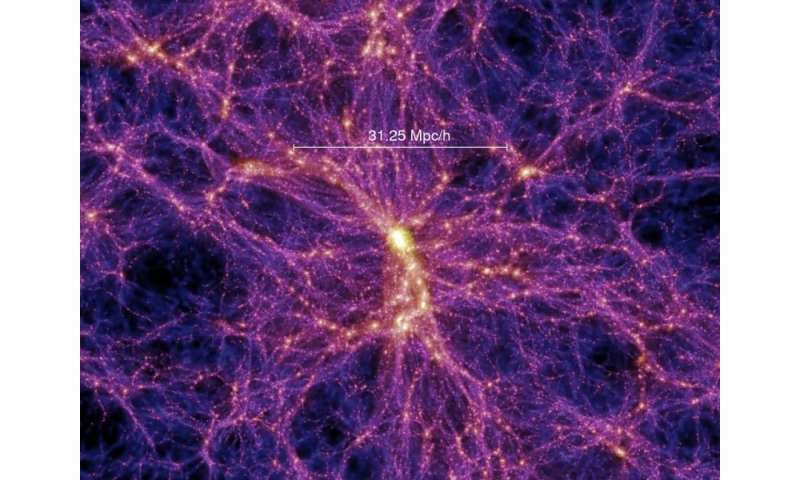 The astrophysicists pointed XMM in the direction of the areas where they suspected to find the presence of filaments, and therefore, the presence of 10-million degree hot gas structures. For the first time, they were able to measure the temperature and density of these objects, and found that they corresponded to the predictions of the numerical models. For this reason, we now have a grasp of the form taken by the missing ordinary matter. In fact, if the researchers manage to measure the atoms in these filaments, they will be able to estimate the number of heavy nuclei formed by stars since the beginning of the universe. In order to deepen this research, the European Space Agency (ESA) is in the process of developing a new space telescope. Switzerland and the researchers from UNIGE are especially involved in this project. The telescope, named Athena, should be operational in the mid-2020s. This is good news. I have assumed that the "missing matter" conundrum was simply due to our lack of understanding of Gravity at large scales, and that we were misunderstanding something and creating an overly large estimation of what matter should exist based on that. It would be great if we could put some of this to bed with proof. Nothing is worse than speculation based on previous speculation, so much uncertainty. Good work guys! Large-scale galaxy surveys have shown that the distribution of ordinary matter in the Universe is not homogeneous. Contrary to the foundational tenent of GR, but who's paying attention anyway. Instead, under the action of gravity, matter is concentrated into filamentary structures, forming a network of knots and links called the 'cosmic web'. This is a completely asinine statement and shows how remarkably ignorant astrophysicists are of the most common form of matter in the Universe, plasma. Plasma's filamentary nature is due to EM forces, gravity is nearly meaningless when describing this fundamental behavior of plasma. Then again, if astrophysicists actually applied the correct physics (which they apparently know nothing about) the only discoveries they would be making is that they have "discovered" themselves out of a cushy job where they get to make BS up as they go. ""Large-scale galaxy surveys have shown that the distribution of ordinary matter in the Universe is not homogeneous. Instead, under the action of gravity, matter is concentrated into filamentary structures, forming a network of knots and links called the 'cosmic web'. " According the cosmic evolutionists - the big bangers, the dark energy whatever it means, dominate gravity and cause the expansion of the universe . But how is it possible the formation of cosmic structures in this scenario? Magic?. Wrong as usual. GR has no such postulate, in fact there are many inhomogeneous cosmological solutions to GR such as Bianchi models. The cosmological principle on the other hand has nothing to do with GR, it states that structure tends to zero at the largest scales, this is observed in large scale structure surveys. But how is it possible the formation of cosmic structures in this scenario? Gravitational collapse. That has been proven to work as you can see in the millennium simulation in the top image. Just gravity, initial conditions from the CMB and time. Of course it is articles like this that will give a slow transition to the correct physics and explanations of how our Universe, and consequently give us clues about the construction of Multiverses, all depend not only upon plasma, but photon interaction with plasma, at the right states, that can precipitate out full atoms instead of either free nuclei or 'static' electrical charge in the form of magnetic currents. Galaxies are actually magnetic constructs rather than gravitic. The gravity works fine when the objects are close enough to each other, but the magnetic field of their entire area, from star to heliopause, is a lot stronger of a pull than that of just the gravitics. This would be working on a scale that does not touch the inner planets, almost like they are protected shells of electrons, the outer fields do the job, just as valence would in an atom. This can be seen to work on globular cluster to galactic scales and larger to galactic clusters, fractal iterations. So in clusters the baryons missing in the bulge appear to be located in the X-ray gas near the outskirts: clusters have the cosmic baryons fraction. In modelling the lensing data of cluster A1689 this has been established with great precision, see arXiv:1510.06958. In A1689 there is a mass separation up to 2 Mpc in radius, 4 Mpc in diameter. Outside this, baryons occur in X-ray gas at their cosmic fraction of 16% of the total matter. The observations of A2744 support this, noting that the most of the X-ray gas occurs in filaments up to 8 Mpc. Gravitational collapse is in contradiction with physics. As when we have the claim that it will from the thick fog occur the stone. Gravity is proven, the particles come together attract neighboring particles, why invent? Again, claims that galaxies arise out of gas (collapse), as opposed to emerging galaxies through the gathering of stars (galaxies without stars there). If it is something far does not mean that outside of physical laws. How is it against the laws of physics? Your stuff about fog and stones translated into English came out as gibberish. Who is saying laws of physics don't apply at great distances from us? Where do these gathering stars that form the galaxy come from? Telescopes reveal that the nebulae one after another collapse (not spread) and immediately formed a giant star. Every second, flashed a new giant star, which has already burnt out all the fuel and immediately explodes that create a black hole and a large number of other giant stars. This is our official physics. What made the nebulae you speak of start collapsing and form a star? Do you know how supernova occur? How black hole formation occurs? How the new stars are formed?Everything you've said so far supports gravitational collapse. Where lies the Spirit of Science ? science at crossroads-2004. need to search beyond einstein-NASA 2003. go back 36 years or more. Both carl Sagan and Alfven tried to develop curiosity on :cosmology myth or Science ! In this spectators arena- one lands up-Save Earth planet and Life Support. what is missing ? Cosmic function of the universe- in search of origins that needs to avoid cosmic confusion or Cosmos Anarchy to drive reluctant horses - cosmic Chariot! cosmology Vedas Interlinks search in depth for solutions through cosmos Quest .